Gotta work on that ratio! 🙂 For now I am looking through my latest fabric horde and drooling after all the possiblities. Very good quality wool, i think it is thin enough for skirts and good for jackets and thin coats. It can be stretched a little on bias as well. sadly, the real color is a lot lighter than pictured. I was hoping for a forest green short skirt. I guess I didnt see this. now I am not so sure about what to do with it. Any suggestions? 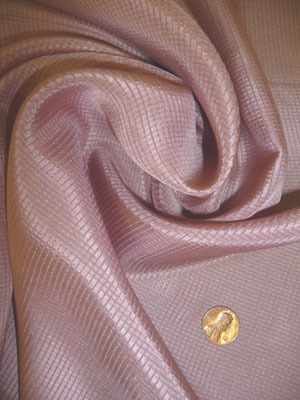 Sometimes, the difference between polyester and silk is so subtle! I like this shade of pink, sort of a grey-pink with interesting patterns on it. I think it will make a interesting, and simple top. I also bought some Wool Tricotine in camel color for a new trench coat — the old one I made has some issues with the interfacing, the buttons are pulling the fabric in a weird way, cotton twill is not the greatest material for a trenchcoat, and topstitching everything in green thread was not one of my brightest moment. The material turned out quite nice and crisp, but unfortunately it is already sold out. And I really want one! (Her looking so gorgeous while pregnant also makes me look forward to being pregnant in the future 😛 ) I was thinking about making something like that out of the bamboo knit, but make it flexible so that it looks good on just the normal old me, or a preggy me in the future. Well, actually, I just really like the idea of flexible clothing. I think all the ties makes it possible to do that, but we will see how it goes. 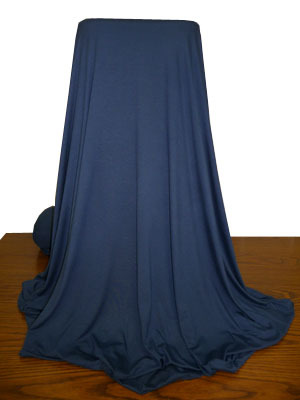 Also got navy charmeuse and navy cotton satin from there, which are sold out. I find that fabric mart almost never disappoint me in terms of quality of their fabric. However, their color on picture and in person occasionally doesnt match too well! This entry was posted on Monday, January 3rd, 2011 at 10:08 pm	and posted in inspiration, sewing, tips. You can follow any responses to this entry through the RSS 2.0 feed. « Goodbye 2010, hello 2011! i love that white cropped sleeve coat! gorgeous! i would love see you make one that looks like it. i made a comment on hanamik’s top as well on her blog – she really looks great! it would be difficult to ski with a big belly 🙂 but imagine in a few years you would be teaching a cute little one how to ski! they look sooo cute on skis! Eeeewwwww…that’s so awful! Why would anyone want to spoil the beauty of snow and pee on it? That’s just awful.